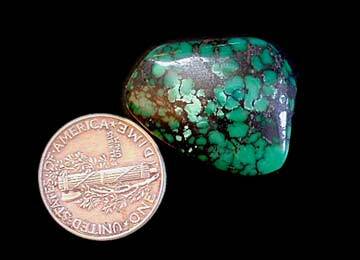 The turquoise that comes out of Tibet is usually of a green nature with a strong black matrix. The Tibetans considered it to be a powerful stone and many wear it for good fortune. These cabochons are cut from antique beads hundreds of years old. They are excitingly beautiful when set in gold and the story of their history is told.